ACRYLIC Art Sets for every age group. These Acrylic Art Sets offer quality components and portability. Take them with you anywhere, whether studio, classroom, field or home. Make GREAT GIFTS, too! 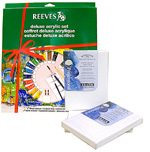 Reeves Acrylic Paint Set for Beginners includes Artist Canvas and the basic essentials needed to start painting with Acrylics. from beginners to artists on-the-go. Comprehensive set has everything the acrylics artist needs in a convenient, portable format.